The TROPOMI Portal for Instrument and Calibration contains a wide range of information about TROPOMI L01b for all four detectors including: engineering and housekeeping data, monitoring and trends, life limited items, and reporting. Other features include an orbit tracker for TROPOMI (currently for OMI), a launch countdown, a range of quicklook data, and a calendar overview of planned and executed orbits. 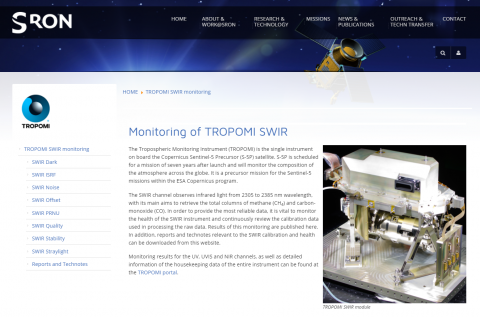 The site for Monitoring of TROPOMI SWIR contains additional information on the monitoring and calibration status of the SWIR detector.